I have two rules, to which I have stuck pretty hard and pretty fast, for the 40 opinion pieces I’ve written this year. First, to write about topical issues of urgency and import, attempting to draw out general philosophical truths. (No, really.) Secondly, to construct a thesis which moves forward the argument, which does not seek simply to gripe and groan, but offers a constructive alternative, a viable solution. Well, sorry and all that, but enough’s enough: it’s time to beat up on the new BBC weather forecast. I didn’t come to it untainted. Before I first saw the modish 3-D whizz-bang graphics, I’d read the unflattering reviews, heard a few disgruntled vox pops. But, if anything, that made me more determined to see the good in it all: I’m that kind of contrarian soul. Then I saw the forecast. And I understood the backlash. So much so, I’m joining in. Why do we have to view Britain at an obtuse 30-degree angle which gives greater prominence to northern France than to Scotland (which can still just about be seen if you have a pair of opera glasses to hand)? Why is Britain portrayed as sludge-brown? This country is pretty much green from the sky, as can be proven by aerial photographs. Now Spain is a different matter – I remember the first time I viewed it from a plane, and being struck by quite how scorched it all appeared compared to this isle’s verdant splendours. But we’re green, dammit, and should be shown as such. Why does the weather seem to have a symbol only for rain? I mean, I know the weather is especially inclement right now. But, if you believe the BBC, we’re shortly to become one giant reservoir. (No wonder the country’s turned to mud.) Bizarrely, the only patches of green allowed are those indicating especially heavy rainfall. As it happens, I think I’ve worked it out now. Where it’s blue it’s raining; where it’s dark brown, it’s cloudy; and where the brown is a scintilla lighter, it’s sunny. I think. But as there are no longer any little clouds or smiley suns, I really haven’t the foggiest. 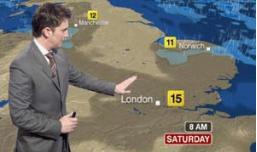 For a long time, I have lined-up the weather forecast to be my first item consigned to Room 101. Not simply because I live in England, and so my entire metaphysical disposition is fixed by the seasons, my whole life determined by a force of nature I cannot control. No, I had better reasons than a mere trifle like that. First, the forecasts are a black hole in my life. How often have I got to the end of the news, and thought, “I’ll just see what the weather is going to do tomorrow.”? Only to awaken from my reverie several minutes later absolutely clueless as to whether I should take an umbrella to work, or throw a sickie and head for the nearest beach. The Met Office is equipped, it seems, with special brain-bewitching powers capable of rendering my brain otiose for minutes at a time. Move over Derren Brown, here comes Alex Deakin. Secondly, on those rare occasions when I have remained conscious throughout, half the programme seems to have been taken up with explaining to me why today’s weather happened. As if I cared. I’m a grown-up now: I don’t have to sit through double Geography on a Monday morning in Mr Jacobsen’s freezing cold classroom while he tries to correct the class’s misapprehension that isobars are actually called ‘icybars’, which is why it’s always cold when they’re close together. And very finally, and I know it’s a minor complaint (but what the hell if you’ve read this far), PLEASE don’t tell me there’s a 50% chance of rain. Because that means it’s either going to rain, or it’s not – which really doesn’t advance the cause of meteorological science that much.